Welcome to Plumbers Without Borders! We are a grass-roots, volunteer-driven organization. We extend an open invitation to anyone wishing to help us develop, whether it be with social media, organizational structure, partnership formations, project recommendations, news stories, fundraising, committees, and educational outreach, your participation is important! 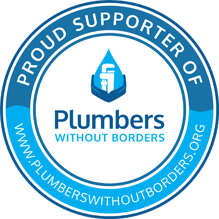 Following the devastating 2010 earthquake in Haiti, and inspired by the generous willingness of pro-bono expertise in the plumbing community, two nearly-retired Seattle plumbers and their wives, pursued a life-long dream of “giving back” by forming Plumbers Without Borders. We are a 501 (c) (3) non-profit organization. To connect and mobilize volunteer plumbers and industry resources with organizations and projects dedicated to safe water and sanitation. PWB is building an online database network of volunteers, organizations and projects. We believe that by connecting plumbing volunteers and industry resources with organizations and their projects, everyone benefits, and we move closer to reaching the ultimate goal of improving health in all communities, worldwide. Our vision is a world where everyone has access to safe water and sanitation – where senseless suffering and disease is eradicated by the implementation of appropriate plumbing and sanitary systems. Training and education, in the prevention of water-borne diseases, and the implementation of safe and sustainable sanitary systems is critical to building and improving local capacity in all communities, whether developed or developing. All building trades and related services and products are welcome and needed.